A few years ago, we endured a time of discouragement and trials galore. My husband and I were both under a lot of external stress, both personal and from ministry, and our marriage temporarily suffered. I faced the temptation to give up nearly daily! I felt like one of the Israelites in the desert, bemoaning my situation and feeling helpless to enact change. It’s almost supper time, but the stove top sits empty and no pleasing aromas fragrance the air. I’ve not even yet decided what to cook, let alone made any sort of preparations. Instead, I’m sitting in my bedroom trying desperately to pray while my preschoolers whine for attention right outside of the bedroom door. My husband, weary from our recent argument, sits slumped over just outside the door at the dining room table. He’s grumbling over the budget and seems unaware of the noise around him. There is no peace, no quiet here. But I need to pray because I am one moment away from falling. One moment from allowing my impatience, anger, resentment, and frustration to spill over onto my family. One moment away from blowing it. One moment from losing any chance to overcome temptation. At this moment I am certain, beyond a shadow of a doubt, that Satan has set his sights on me; I’m being tested. It isn’t the first of such evenings in my home. In fact, our marriage relationship has been under strain for a few months now, and I’ve grown oh-so-weary of “fighting the good fight.” However, this past week, God has shown me the truth of my situation; I haven’t been doing my part, either. I have been selfish. I have been lazy. I have been avoiding the time with my Lord that I need. Thus, I recently resolved to make some positive changes, knowing full well that temptation would linger near. So as I sit here in my room praying while the chaos rages just outside of the door, I laugh. It’s absurd, even comical, that every other person in my home would suddenly become distractions at the very moment I attempt to find peace. I want to complain to the Lord that I’m trying so hard to do what is right, to seek Him in my moment of weakness, but He’s not making it very easy! According to His Word, I can overcome temptation, even this temptation. In that moment of laughter, I realize the truth that as long as I’m trying to do right, to obey God, Satan is not going to leave me alone. In fact, He’s even going to use good things like bible study and prayer against me by causing frustration and chaos at just the right moment. Thankfully, now that God has shown me the truth of the matter, Satan cannot win. I see his game plan for what it is, and prayer is a powerful tool! Sorry, Satan, I’m getting up from my throne of self-pity and frustration, and I’m cooking supper tonight. Lord, I thank you for always providing a way out for us, even when it seems impossible or unbearable! 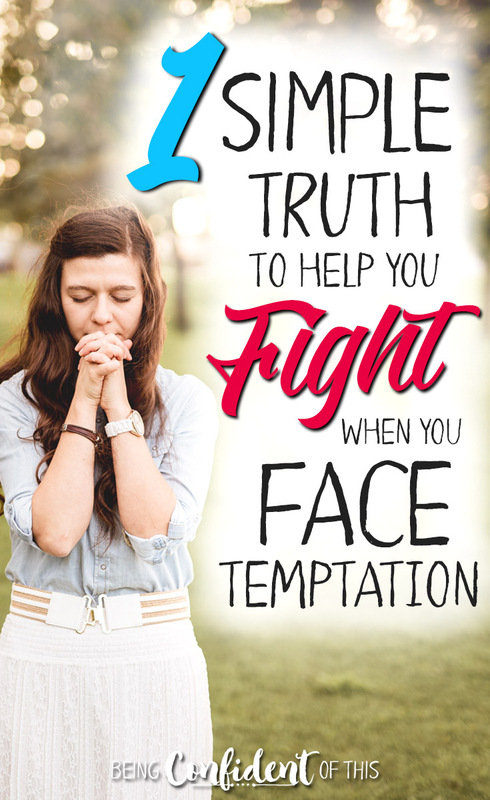 I ask that you would encourage my sisters in Christ today to look for the way out when they face temptation. Help them to see the truth in whatever situations they face. Remind them that You are with them always, every step of the way, even when it doesn’t feel like it. Give them the strength they need to resist temptation and to flee the Devil and remind them of your unfailing love and grace for them because of your Son, Jesus Christ. I ask all of these things in the name of Jesus, Amen. We can overcome temptation, friends, by standing on God’s truth! P.S. 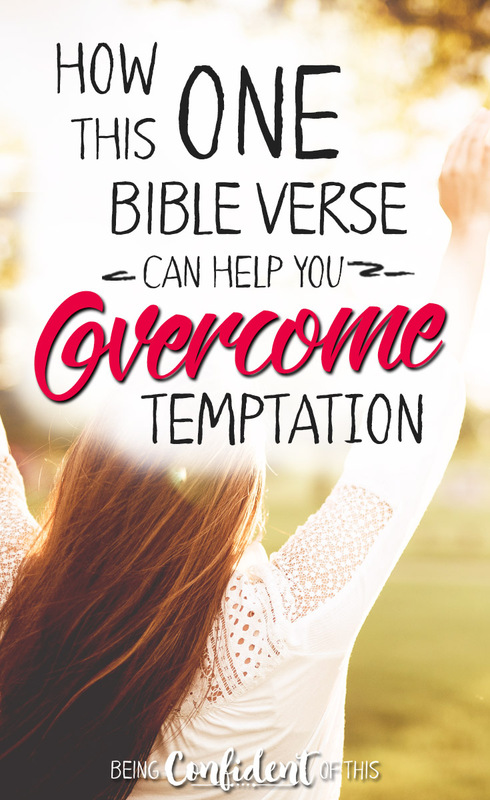 When you’re struggling with temptation, write or print out the verse above and hang it where you will see it frequently. Use God’s Word as a reminder that you CAN overcome! I stared at the half-dangling greenery, feeling frustrated and overwhelmed. Laundry waited to be washed, presents waited to be purchased and wrapped. My work schedule was full and our family calendar even more full. I wanted this Christmas to be different than last year’s holiday. I wanted to really savor the season, but I felt like I was failing. Where was the peace I longed for? How was I missing it? Where was I going wrong? Because the overwhelming emotion ruling my heart lately was an awful lot of stress. Between book writing, and client work, and church-planting, and home life, it often seems like there just aren’t enough hours in a day. But I need some peace. I need to savor this season because I’ve had oh-so-many reminders this year, friends, that our time here on earth is short, our days and hours and minutes never guaranteed. And as our oldest son prepares to head out into the world, I feel that reality all the more keenly. So, how do we make the most of Christmas without becoming burdened and overwhelmed? 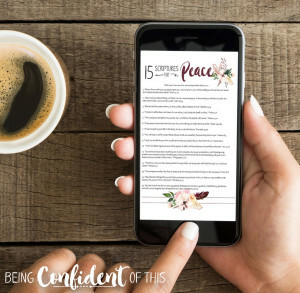 How do we truly seek peace without creating additional stress by adding another thing to the to-do list ? 1. 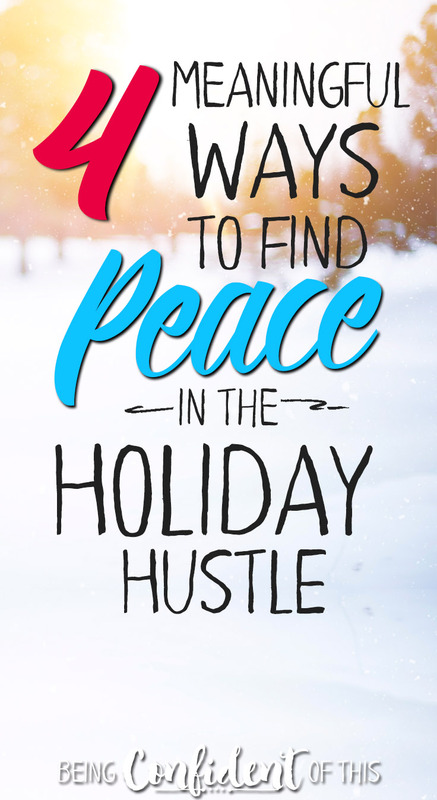 We put first things first for peace in the holiday hustle. When I feel overwhelmed, I can often pinpoint one of the root causes as a lack of consistent quiet time. Whenever my calendar gets too full, my time with Jesus often becomes less and less. This is a reality we must guard against, friends. We may even be tempted to justify spending less time in His presence because we’re spending time doing advent activities with our family, attending extra church services, and so forth. Truthfully, nothing can take the place of that one-on-one time with Emmanuel, the God who came to be with us. We’re literally starving our souls when we neglect this most important relationship, and we will reap the fruit of that neglect in our lives. Stress, lack of motivation, discontent, worry, impatience – all can be indicators of a spiritual problem. A return to right priorities goes a long way toward helping us regain peace in the holiday hustle! 2. We content ourselves with “good enough” for peace in the holiday hustle. I know I’m preaching to the choir here, but perfect holidays don’t exist in reality. When we fail to reign in our expectations for what a “good Christmas” entails, we set ourselves up for failure every time! I have to continually remind myself this year that some is better than none. Some exercise is better than no exercise. Some Christmas baking is better than no Christmas baking. Some advent devotions with the kids is better than no advent. It’s all about showing yourself some grace. After all, would your husband and children rather have lots of Christmas goodies but a stressed-out, grumpy mama, or would they prefer less treats and a mama who is at peace? I can guarantee mine would choose the latter every time. I cannot have a perfect Christmas, and neither can you, friend. Let’s just toss that impossible notion right out into the cold. What we can have is a meaningful, peaceful Christmas, and that happens when we slow down and savor the season. 3. We pray for peace in the holiday hustle. It seems to me that the Enemy works overtime during the Christmas season. As we plan and prepare to celebrate Christ’s birth with our loved ones, he’s planning for our destruction. But we need not fear his tactics, friends, because his power is limited while our God’s power is limitless. In Christ, we have the power to resist temptation, to choose peace, to choose kindness, to choose love, and all of the other fruit of the Spirit. Ask the Father for a special covering this Christmas. I know I will be asking the same for our household – that God’s peace will rule our home, that we will be free to joyfully celebrate Jesus’ birth, that we will be free to enjoy loved ones and gift giving and delicious food, and so on. Peace, Father, give us peace this Christmas! 4. We seek scripture to give us peace in the holiday hustle. I can’t tell you how often the Spirit brings a verse to mind that I’ve previously memorized just when I need it most. I’m certain you know what I mean, friends. God’s Word brings us peace through His promises and His guidance. So when I was thinking of you all, faithful friends and readers, and wondering what small gift I might be able to give you this Christmas, I thought of what busy women needed most during the holidays. If you’re already on my subscriber list, you should have received a link to the printable below in your inbox. But if you’re new here, just fill in your information at the bottom of this article to access all of our free resources, as well as join the list for encouraging monthly newsletters. Above all, take time to seek real peace this Christmas. The best Peace you’ll ever find came to Earth as a mere babe thousands of years ago, just so He might know us. If you’ve never accepted the gift of His love and salvation, you can do so today. Just cry out to Jesus. And let Christ give you peace.